I am so lucky to live in a year round agricultural area and especially one with so many organic farms that grow speciality produce. Suzies Farm is one of my favorites. This week Suzies offered fresh Tatsoi. If you haven’t tried Tatsoi before it’s an Asian green from the Brassica family and tastes a bit like a combination of Bok Choy and Spinach. 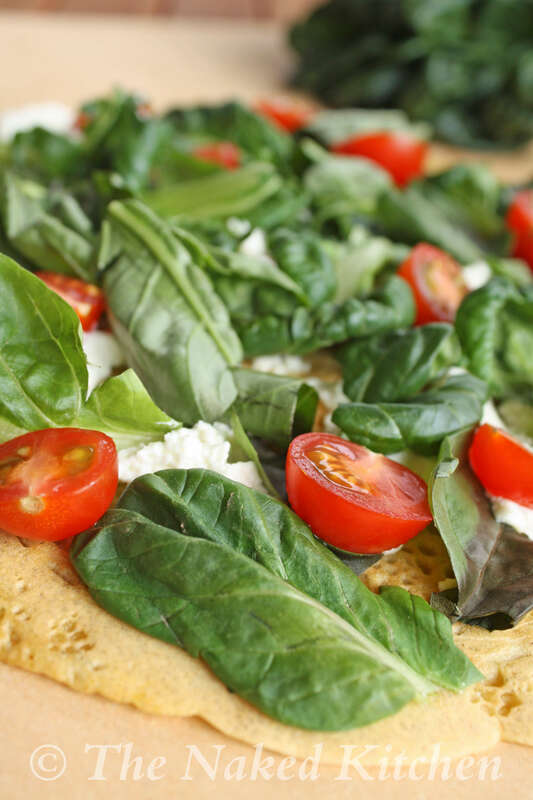 It’s glossy dark green leaves are curly and crispy and super for this spin on Pizza Margherita. In a small bowl mix the flours, salt and seasoning. Add 1/4 cup of the water and stir until well mixed and any lumps are broken up. Add the remaining 1/4 cup water and 1 tbsp oil. Stir until combined. The batter should be like a thin pancake batter. Add more water to thin if necessary. Set aside for at least 30-60 minutes. Heat a 12 inch non stick skillet over medium high heat (see notes). Add the remaining teaspoon of oil to the skillet. Give the batter one last stir and pour into the pan. Swirl around to evenly distribute the batter. Cook 3-4 minutes. As it cooks it will firm up and change from looking shiny to dull. Run a spatula around the edges until it’s loosened and then flip over. Reduce heat to medium. 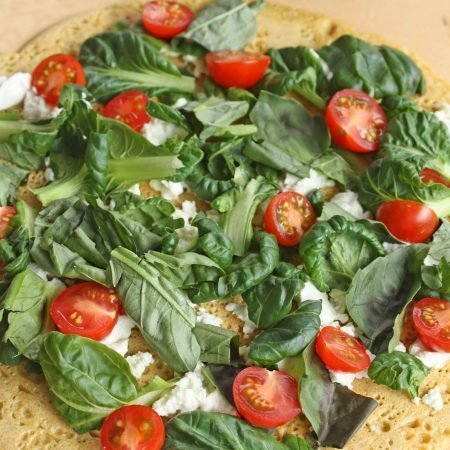 Evenly distribute the Tatsoi, basil, tomatoes and cheese over the top. Once the Tatsoi has lightly wilted and the cheese has melted, about another 4-5 minutes, remove to a plate. Cut into 4 pieces and serve. This pizza is best eaten right away and does not save well. This recipe works perfectly in a 12 inch skillet so if you are using a different size skillet adjust the amount of batter accordingly so you get a thin crispy crust rather than a thick cake-like crust.